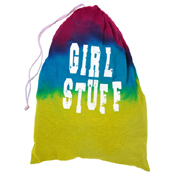 A great place to collect those various and sundry items, this bag from organize.com is made colorful with Tulip® One-Step Tie-Dye Kits™ and your creativity! Prewash bag to remove sizing. Do not use fabric softener or dryer sheets. Cover work surface with tablecloth. Lay bag onto work surface. Wearing rubber gloves, add water to One-Step Fashion Dye bottles. Replace caps tightly. Shake until dye is dissolved. Apply desired color of dye to one third of bag. Repeat procedure twice more, using other two colors. Cover with garbage bag. Let set 4-6 hours. Wash in a large load of water with a small amount of laundry soap. Line dry. Arrange Iron-On Transfer letters to spell message on front of bag. Iron letters to adhere, following instructions on package. Let cool. Remove paper.